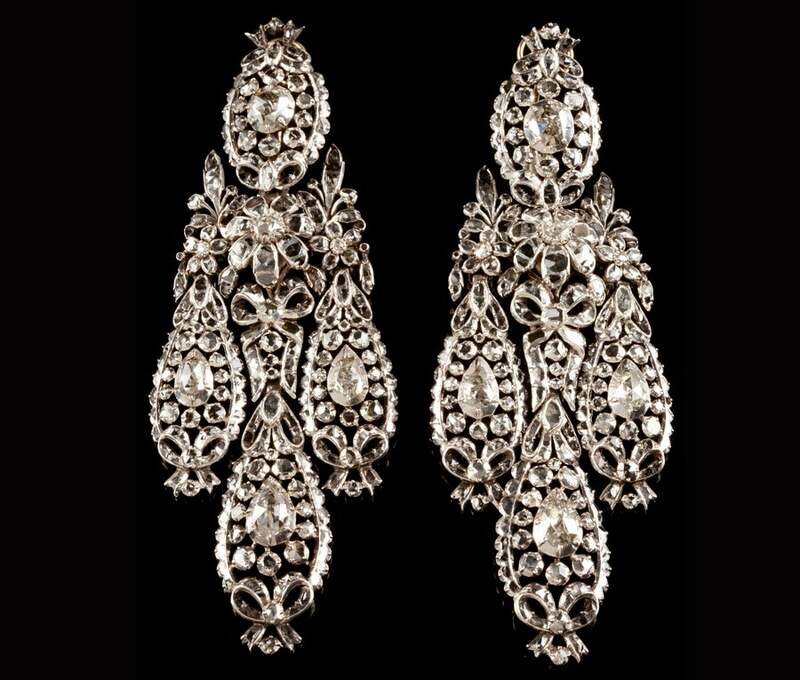 Fit for a Queen is more than a figure of speech when the subject is these large 18th century, Portuguese silver earrings, lavishly set with rose-cut diamonds. 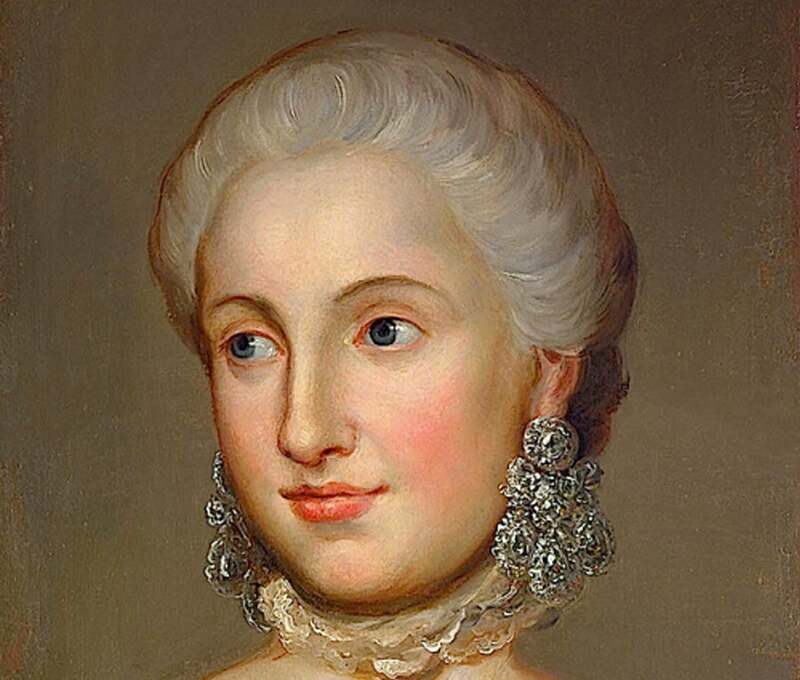 They compare favourably with the diamond earrings shown in this portrait of Princess Isabella of Parma, painted by Anton Mengs soon after her 1760 marriage to Joseph II, the Holy Roman Emperor. 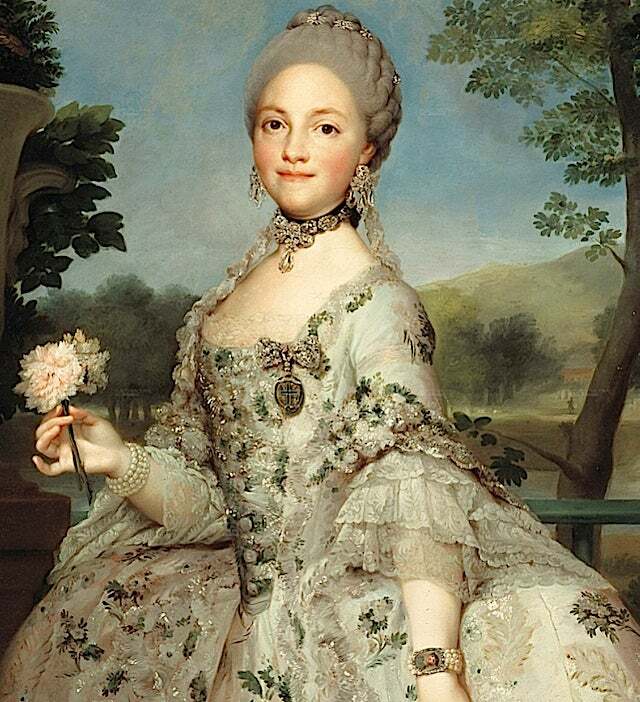 They are extravagant even when compared to the earrings worn by Maria Luisa of Parma and Queen of Spain in in another Mengs portrait of 1764. 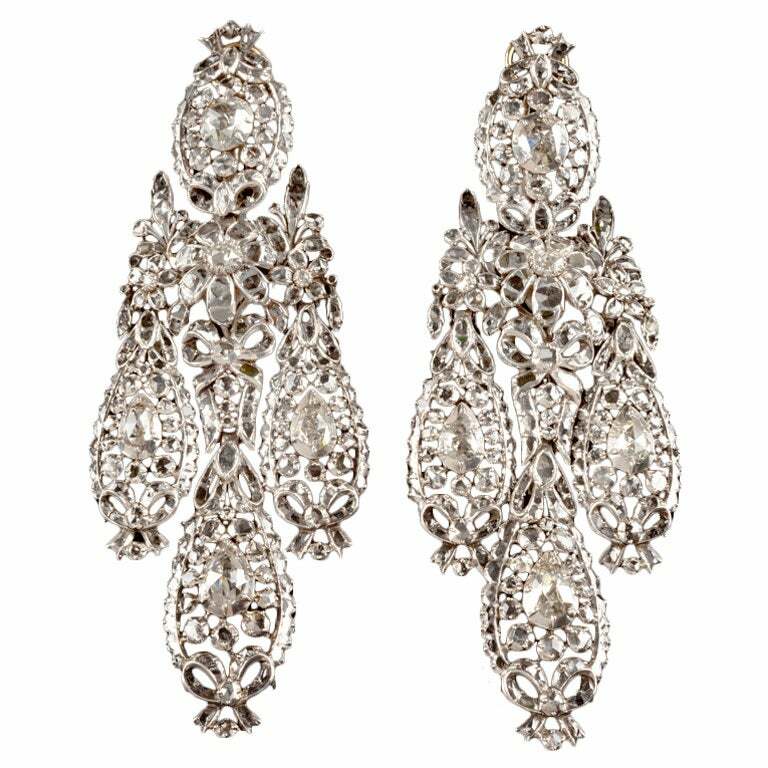 These magnificent earrings come from the collection of Américo Barreto the internationally famous 20th- century Portuguese jewellery collector and dealer. His legendary private collection was long on view in the Museum of Ancient Art in Lisbon. Selections from the part of itwhich he and his wife bequeathed to the museum are illustrated in its book, "Five Centuries of Jewelry." 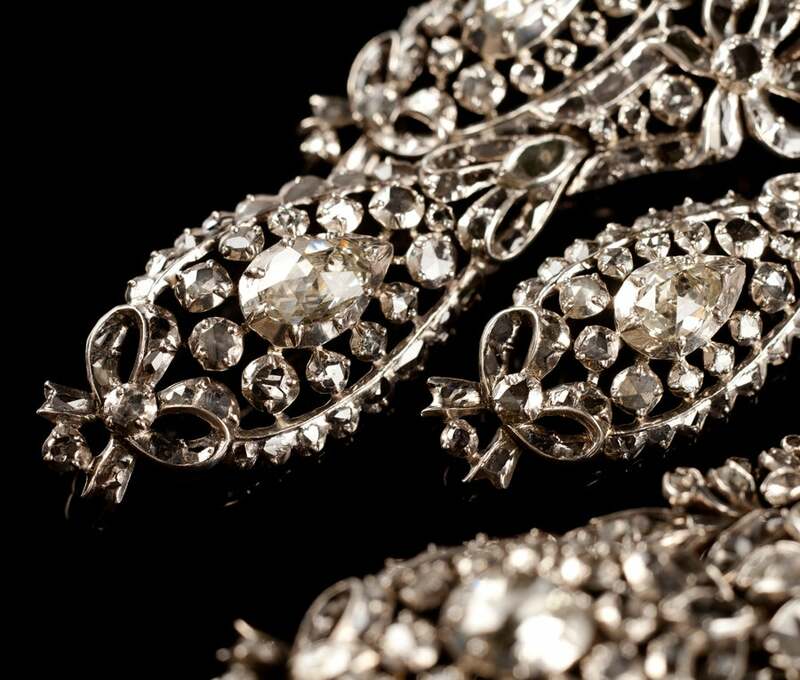 These particular earrings left Barreto’s collection during the 1970s. Although no archival trail leads us to earlier owners, it is worth pointing out that Barreto was an expert in royal jewels and served as consultant for Portugal’s Crown Jewels housed in the National Palace of Ajuda. The stones are set so that they appear to melt into the floral design, Portugal, third quarter of the 18th century. Portugal, third quarter of the 18th century. weight: 65.8 grams length: 11 cm. Girandole (French, from the Italian girandola) originally referred to an ornamental branched candlestick composed of several lights. They cameinto use during the second half of the 17th century, and were made in pairs. Always luxury items, in the 18th century - the period of great French decoration – their makers were outstanding craftsmen who fashioned them in gold, gilded silver, bronze or wood. When girandole is used In jewelry girandole refers to a design, most often found in earrings, in which three dangling pear-shaped ornaments are suspended from a central motif, often a bow. These were a favourite court jewel in the 17th century when three or five such pear-shaped ornaments hung down from the bow. All the dangles moved; producing a dazzling light show when seen in candlelight. In the 18th century new versions of the girandole model appeared. In the earrings pictured here, employing a designfavored by European courts, the central bow has been replaced by a bouquet. 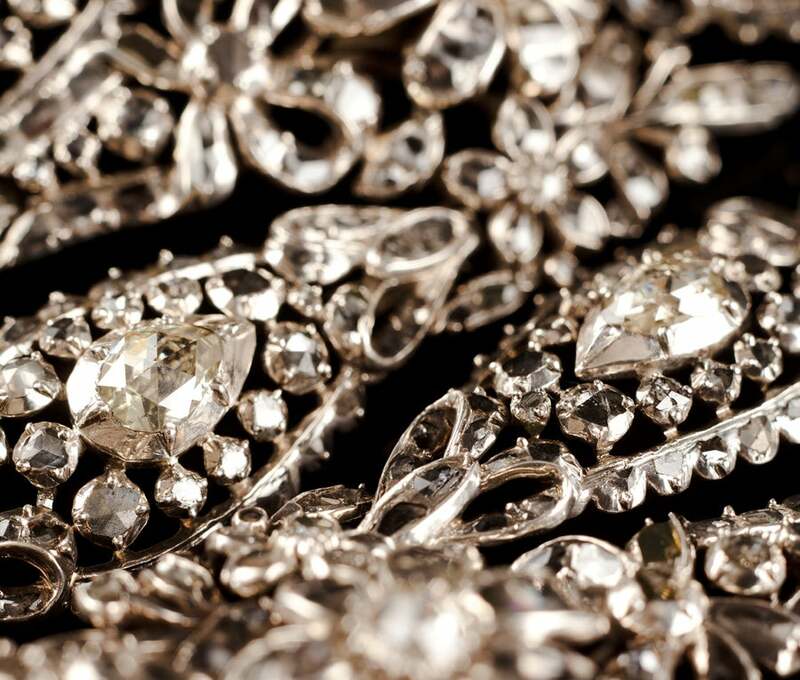 The diamonds are set so that they appear to melt into the floral design. No metal interferes with the dramatic display of sparkling light they produced and which they continue to produce today. 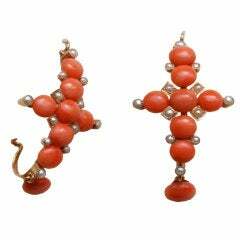 A pair of large 18 carat gold earrings with cabochon corals and small half natural pearls in the shape of crosses, France, 19th century.